Shah Rukh Khan is an award winning actor producer and television personality. He has stared in over 80 films and has won numerous awards including 14 Filmfare Awards. Khan was born in 1965 on 2nd November in New Delhi, he spent the first five years of his life In Manglore with his grandparents. Khan is often referred to as "King Khan", "The Baadshah of Bollywood", and "The King of Bollywood". Shak Rukh Khan is married to his childhood sweetheart Gauri Chibber and they have 3 children together, two sons and one daughter. Khan has been honoured with several international awards, including Chevalier de la Legion d'Honneur (France's highest civilian award), Wissame Al Kafaa Al Fikria (Morocco's highest honour), Malaysian title of 'Datuk' (akin to the British knighthood). Shah Rukh was also feted with UNESCO's Pyramide con Marni award in 2011 for his charity engagements and social commitment towards providing education for children. Khan was the first Indian to win this accolade. 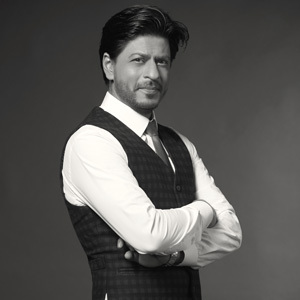 With more than 200 awards won throughout his career, Khan is recognised as one of the best actors in India. Khan is co-chairman of Red Chillies Entertainment - a motion picture production company and co-owner of the Kolkata Knight Riders an Indian Premier League cricket team. In 2008 Newsweek named Khan as one of the 50 most powerful people in the world. Throughout his career Khan has broken numerous box office records, including the record for achieving the fastest Rs100 crore (ten million) at the Indian box office for his 2014 film Happy New Year. Khan has taken approximately Rs 1642.52 crore throughout his 20 year career. Shah Rukh Khan is also in the Guinness Book of Records as Highest earning Bollywood star. Shah Rukh Khan, is the best example of a self-made actor. Shah Rukh Khan belonged to a middle class family in Delhi. He studied acting under famous theatre director Barry John at Delhi's Theatre Action Group. Khan went on to become one of the most celebrated actors in Bollywood.